It’s hard to believe this nugget resembling a knobby potato that a dog has just dug out of the ground is worth a fortune. But then I take a whiff. How can I describe the heady aroma? Is it earth, musk, garlic, honey, hay? Whatever, it’s intoxicating. We’ve discovered the illusive “white gold” of Alba. And the hunt has just begun. I’ve signed up with a company called Italian Connection for a gourmet romp of the Piedmont area of northern Italy. . And today I can tick off truffle hunt from my bucket list of things to do before I die. Seductive and mysterious, truffles were thought to be an aphrodisiac by the ancient Greeks and Romans. Their exorbitant price (up to $6,000 per kilogram based on availability and quality) is due to their unpredictable growth habits and the fact that no one has been able to cultivate these rare and illusive fungi that grow in a symbiotic relationship with the roots of oak, hazelnut and poplar trees. Normally a truffle hunter, known as a trifulao, works alone, never divulging his truffle troves. In fact, canines have been poisoned and kidnapped for ransom in this dog-eat-dog quest for white diamonds in the rough. 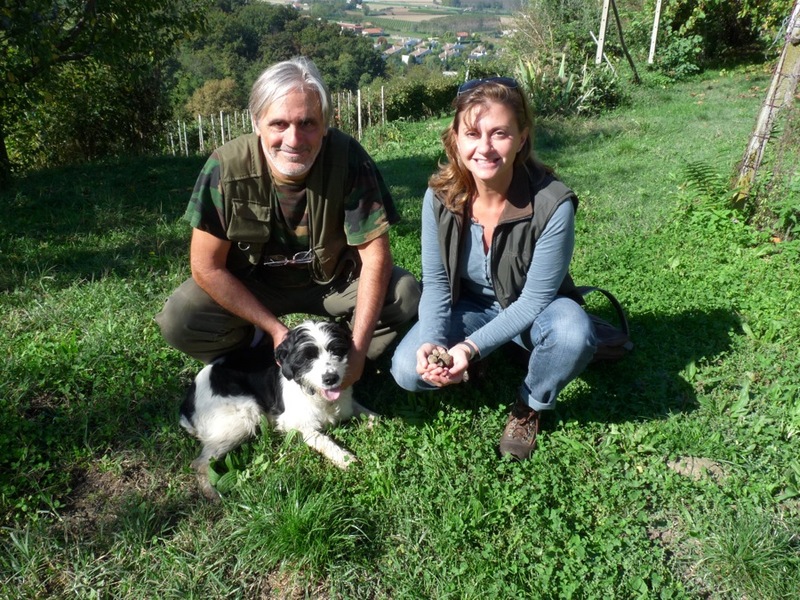 But thanks to our Italian Connection guides, Peter Blackman and Daniela Bigatti, trifulao Ermanno Scaglione has agreed to take us on a hunt through the forest at Castelgherlone, a wine estate outside of Alba. I guess Ermanno feels fairly confident that his secrets are safe with a group of eleven North Americans who aren’t likely to return with their own truffle dogs. Just as the fungi and tree roots have a special relationship, so do Ermanno and his adorable mutt, Mara. “Aspetto,” calls Ermanno after Mara unearths another truffle. She obediently waits until he exchanges the nugget, about the size of a golf ball, for a piece of kibble. This is clearly an example of Pavlov’s dog in action. Ermanno explains that he took about three months to train Mara. By putting some truffle bits in her food she acquires a taste for them and comes to associate that taste and smell with food. Ermanno then taught Mara to fetch balls scented with truffles. Eventually, he buried the balls deeper and further away. It’s a game in which Mara excels and by the wag of her tail she obviously loves. Originally wild pigs were employed to hunt truffles but they were too hard to train and often gobbled up the prize before the trifulao could get his hands on it. It takes about three months for winter white truffles to mature at which point their spores release that addictive aroma from beneath the earth. Often the truffle hunter and his dog have their best luck early in the autumn evenings when the cold air keeps the perfume close to the ground. 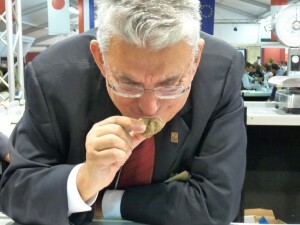 Alba’s White Truffle Fair, from mid-September to early December, includes many competitions, outdoor markets, and charity auctions. I’m told that the donkey race palio is hilarious, unlike its serious counterpart in Siena. The grand finale to our truffle binge was dinner at a country inn where it’s possible to B.Y.O.T. Indeed, Peter who had purchased about 300 € of white gold from Ermanno, turned the bounty over to the chef. The raw truffles were presented on a bed of uncooked Arborio rice in the middle of the table. We passed them around and shaved liberal portions over a local sausage with creamy sauce, porcini risotto and scrambled eggs using special truffle slicers fitted with stainless steel blades. Yes, it was a once-in-a-lifetime indulgence. Truffle hunting was just one of the epicurean highlights of the Piedmont romp. Thankfully each day included a six to 15-kilometre walk to counterbalance all the remarkable food and wine. After Alba we tromped through the vineyards and up to the town of Barbaresco for a wine tasting and lunch. Most napped in the van while our guides delivered us to Lake Orta and its medieval cobblestone village, Orta San Giulio, where there was plenty of free time to explore the town, shop or take a boat over to Isola San Giulio, known as the Island of Silence and dominated by a baroque Basilica. Going on an authentic truffle hunt and dinner at a friend’s home are just a couple of examples of what makes Italian Connection tours unique. Founder Anita Iaconangelo seeks out off-the-beaten track trails and experiences. High above Lake Orta, for example, we followed a series of mule paths to an idyllic spot by a stream where Peter had laid out a picnic of local cheeses, cured meets, olives, fresh bread, flavoured honeys and a marvelous chestnut cake. On the last day we hiked up the Monte Mottarone and took a breather at the top to admire the spectacular views of Monte Rosa, the tallest peak in the Swiss Alps and Lakes Maggiore and Orta shimmering below. From there we took the funicular down to the shores of Stresa on Lake Maggiore. . 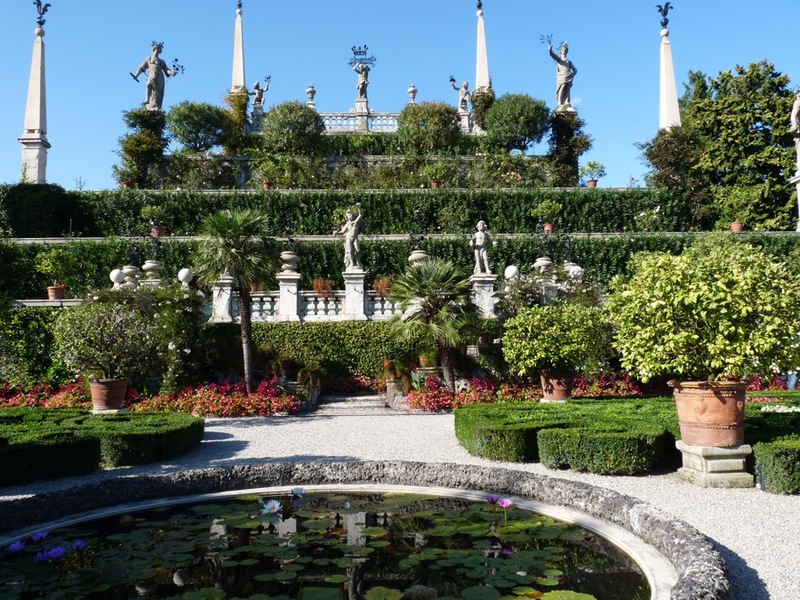 Early in the 1900s Stresa became a stop on the Grand Tour for wealthy Brits and Europeans. 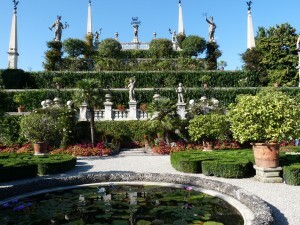 Not to be missed is a boat ride over to the aptly named Isola Bella (Beautiful Island) where Count Borromeo built a palace and fantastic baroque gardens filled with statuary, terraces of perfumed tropical plants and strutting albino peacocks. Here nothing succeeds like excess. We began our final evening with cocktails at the Grand Hotel et des Iles Borromees which must be just as grand and palatial now as it was when Ernest Hemmingway used it as his setting for a romantic tryst in A Farewell to Arms. For dinner Peter and Daniela found a quaint trattoria that was once a tram station up in the hills owned by a talented chef and his gregarious wife. Over plenty of good Piedmont wine and a multi-course feast spiked with more truffles, our group exchanged addresses, toasted our superb guides and discussed various strategies on how to cram all of our souvenir bottles of wine, grappa and truffle oil and packages of dried porcini mushrooms, pasta and Arborio rice into our luggage. I think of them as training aides for my next romp through Italy. After all, Anita Iaconangelo recommends that the best way to prepare for one of her authentic adventures is to “get out and walk, eat pasta and drink wine.” Those are marching orders I can follow with great gusto. The Italian Connection offers cooking and walking tours all over Italy. 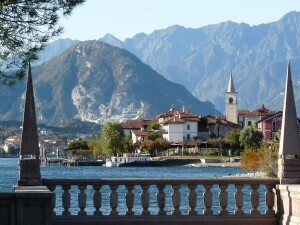 Their Piedmont Vineyards and Lakes six-day jaunt starts in Turin and ends in Stresa.